Olivia develops interpersonal skills by realizing how her words affect her friends. 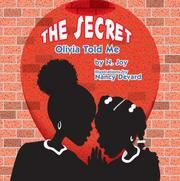 Olivia and her best friend realize the importance of honesty and trust in their friendship. Joy, N., “The secret Olivia told me,” Children's Picture Book Database at Miami University, accessed April 24, 2019, https://dlp.lib.miamioh.edu/picturebook/items/show/13470.